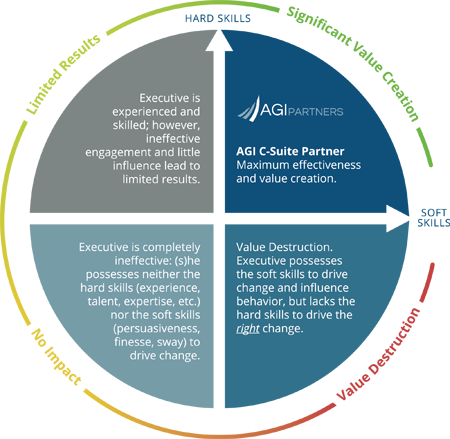 AGI’s C-Suite Partners must engage with both the investment professionals at AGI as well as the management team members at our portfolio companies. The soft skills – a C-Suite Partner’s ability to lead organizational change and influence – are equally important, if not more important, than the hard skills. Without the ability to elicit support from others – specifically engaging the emotions and logic of others to communicate a persuasive vision and connect individuals to their organizations and to their leader – even the most perfectly matched hard skills for any given situation may be reduced to being completely ineffective.The best C-Suite Partners use their empathy to effectively navigate and synthesize the concerns of the firm and the portfolio company management team: they know when to act and equally important – when to listen.